We know Oregon’s economy is booming today. Job growth is outpacing the typical state by a considerable margin. These gains are strong enough to make up the recessionary losses and keep pace with population growth. As labor becomes scarce in a tight market, wages rise. Businesses must compete more on price to attract and retain the best talent. One positive result of these dynamics is the growing labor force and increasing participation rate as more Oregonians look for work. Even as all these good things are happening, a common question from businesses and in terms of the macro outlook is “where is the labor going to come from?” Our office’s view is that the stronger economy will continue to pull Oregonians into the workforce, in addition to the influx of young working age migrants. If you dig into the job opening surveys themselves, they show that a lot of the underlying difficulty in filling positions isn’t just about the number of applicants but also things like requiring experience and not training workers plus low wages, odd hours and the like. All that said, it does not mean there cannot be issues in specific industries or regions of the state, however. Take the case of low-wage workers for example. As the Wall Street Journal reports, across the nation low-wage workers are seeing the strongest wage gains today (admittedly after a long spell of no gains). This is the result of businesses realizing they need to raise wages to get workers in a tighter market. The WSJ highlights the growing number of large corporations, like JP Morgan Chase and McDonalds, that have announced higher pay levels for their workers. However this is happening in Oregon as well. Two weeks ago the Governor’s Council of Economic Advisors took a trip to Newport to meet with community leaders and local businesses (more on the trip soon). One interesting topic was that of the new minimum wage law. Laura Anderson, owner of the fantastic Local Ocean Seafoods restaurant and fish market, noted how she and other businesses were initially worried about the new law and increased business costs. However, as the economy gets tight, wages do rise. Laura noted that today on the coast the effectively minimum wage is $11 per hour. Anecdotally this can be confirmed by the giant banner hanging outside the Newport Taco Bell advertising they are hiring, starting at $11 per hour. All of this is to say that while Oregon is approaching full employment, we do not have great measures of full employment itself. It is more of a concept than a hard calculation. That doesn’t mean we don’t try. That is the entire purpose behind our Total Employment Gap work. Another, simpler and easier-to-understand way to gauge economic slack is to look at the number of unemployed per job opening. How large is the pool of available workers relative to what businesses need? Here, too, labor market slack is diminishing or potentially gone based on the historical patterns. This is true even if you add back in the “missing” workers who dropped out of the labor force. There are myriad reasons this matters for the economy but I will highlight two interrelated items. First, full employment matters for businesses because it does become harder to attract and retain workers when labor is scare. Second, a stronger economy and tighter labor market is great for workers as wages rise. One of the biggest issues with stagnant wages in the 2000s was the fact that the economy never fully tightened. 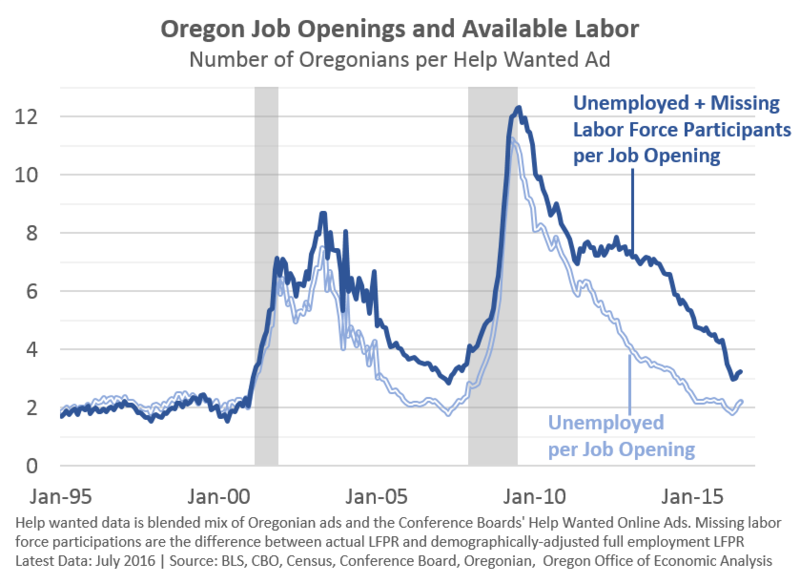 Even with the housing bubble, the mid-2000s expansion was too short and too lackluster for the economy to reach full employment in many places, Oregon included. This also matters for our office’s forecast. Oregon’s gains of 5,000 jobs per month over the past couple of years is not a sustainable rate. Those are peak growth rates. They eat up the economic slack. However as the economy approaches and reaches full employment, growth will slow to a sustainable rate. Right now our estimates show that Oregon needs about 2,000 jobs per month to keep pace with population growth. The exact timing of this transition, or slowing is an open question that we regularly discuss with our advisors. It must also be pointed out that the economy does not typically transition to sustainable rates of growth. It usually slams down into recession and the cycle starts anew. That said, there are not a lot of worrisome signs on the horizon right now and our advisors remain bullish. Note: We are using our office’s blended help wanted ads figures which combines historical newspaper ads with today’s online help wanted. This is important to be able to look at historical patterns. Even as the online help wanted ads data starts in 2005, newspapers were still important than. So simply using just the online data from 2005 through today can be misleading.